My Sandwich Generation: Self Preservation Without the Headache mysandwichgeneration.com » HOW was our FOURTH? This is why my kids didn’t want me to take any pictures of them in memory of OUR 4th of July picnic with visiting family. What are those? 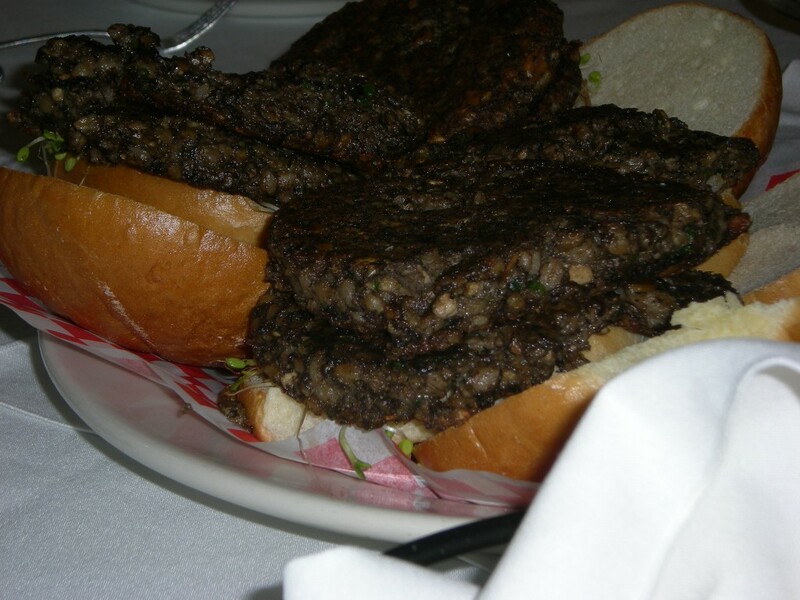 Well..we went to a very fancy shmancy Golf and Country Club to make granny Marnie (electric scooter girl) happy and this gourmet treat was delivered to the table..GRAIN and MUSHROOM BURGERS..ummmmm mmmmm goooooood. Since we didn’t want Marnie to become agitated over money WASTED..I was forced to find a way to make our “cow pies” vanish without drawing attention or making any of the other diners suspicious. When Marnie stepped (wheeled) outside to admire the other equally masterful GUSTATORY creations..I worked fast to make sure each plate of dung patties looked like they had been devoured. Employing the old “wrap it in a napkin” trick..I was successful in saving us grief by running back and forth to the ladies room with the excuse that I had enjoyed too much lemonade. The kids being eternally grateful to their clever mother for saving their LIVES— promised me they would put on a theatrical performance of a lifetime by pretending to eat the remainder.. so Granny could enjoy the fact that she had gotten her money’s worth and sleep that night. At my boys (Alien Dude and Smart Alec) request..no photos (other than the above) were taken to commemorate this day. Posted in Uncategorized 9 years, 9 months ago at 11:55 am.